Worldwide demand for electricity is increasing constantly, fossil resources are being depleted at an ever-increasing pace and their extraction often results in environmental damage and climate change. The sun supplies us with sustainable energy that can be transformed into electricity via PV modules without diminishing the energy reserves of the sun. The use of solar energy enables us to help save fossil resources and protect our environment. Our commitment does not end with support. SUNfarming pursues its projects sustainably and at its own expense, enabling hundreds of participants to train in the pioneering solar energy sector year for year. Our goal is to work in partnership with local partners and universities in your country, in the realization and operation of “SUNfarming Food & Energy Training Projects“. The concept offers a number of highly interesting opportunities for development policy. Technological knowledge and the available resources in the water, energy and nutrition sectors must be used sustainably in order to create an environmentally and climate-friendly development in cities and municipalities. SUNfarming has developed the unique “Food & Energy Urban Concept“: Sustainable solar energy and regional food are produced together – on the same area. More than 80% of the Bahamas are dependent on imported fossil fuels and food. The aim of the Bahamas Hybrid Center is to demonstrate the topics SUNfarming Food & Energy, Electromobility and bioltec Fuel Efficiency Management (Renewable Fuels) in an alliance with 700 Islands Energy to create the conditions for developing an economic model. This will contribute to the independence of the Caribbean countries in terms of fossil fuels as well as food and water security. Opened in 2015, more than 100 electrical engineering instructors and interested persons were taught to this day. Opened in 2013, more than 1000 trainees have been taught to this day. 100 electrical engineers and installers were trained until shortly before the war broke out. Beyond the statutory requirements, SUNfarming voluntarily commits itself to sustainable development and responsible commercial actions. Leaving a clean environment and affordable energy to our children and grandchildren is our duty. SUNfarming feels an obligation to observe this responsibility. We are convinced that with every newly-installed photovoltaic system we come a step closer to the goal of renewable energies as the source of energy supply. 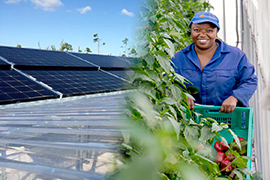 Solar energy not only secures energy supplies in regions with few resources, it also creates sustainable, skilled jobs. With the knowledge and experienced gained from 20 years in green energy we aim to help to make our world more sustainable. The long-term goal of the regenerative mobility association BRM is to achieve a 100 % share of renewable energies in overall German primary energy consumption. To achieve this goal the technology-based promotion of mobility in all fields of renewable energies is supported. Existing framework conditions are being improved to enable the creation and marketing of biogenically and regeneratively created fuels. Has been working since 2002 as Honorary Association President of the BRM (formerly BBK). Until 2009 Peter Schrum was an honorary member of the board of Eurosolar. Has been working since 2002 as Honorary Managing Director of the BRM. With an the outstanding flow of energy the VfL Handball Club started into the new season. And now the energy is renewable: The SUNfarming GmbH, for more than 10 years successful in the field of renewable energies, is the new sponsor of the VfL Potsdam for the upcoming two seasons. Right on cue for the first home game the Potsdamer Eagles could present their new pants. Martin Tauschke, Manager and Co-Founder of SUNfarming located in Erkner near Berlin, shows his commitment to local involvement: “The SUNfarming GmbH has a long-standing relation to sports in Potsdam. As a Potsdamer and former sportsmen in canoeing, regional sponsoring has a special importance for me. My relationship to handball comes from my common time together with Alexander Haase and Björn Rupprecht in the school-team.